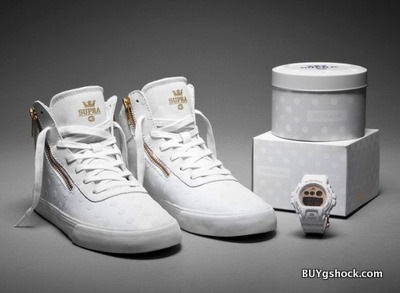 In commemoration of their second collaborative launch, esteemed watchmakers Casio G-SHOCK and leading footwear brand SUPRA design two custom timepieces and two high top silhouette sneakers for the SUPRA x G-SHOCK and SUPRA x G-SHOCK S Series line respectively. 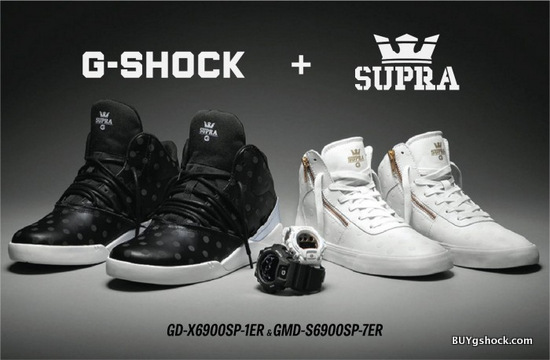 The partnership emphasizes on the innovative technical features, functionality and stylish components available in both G-SHOCK and SUPRA products. 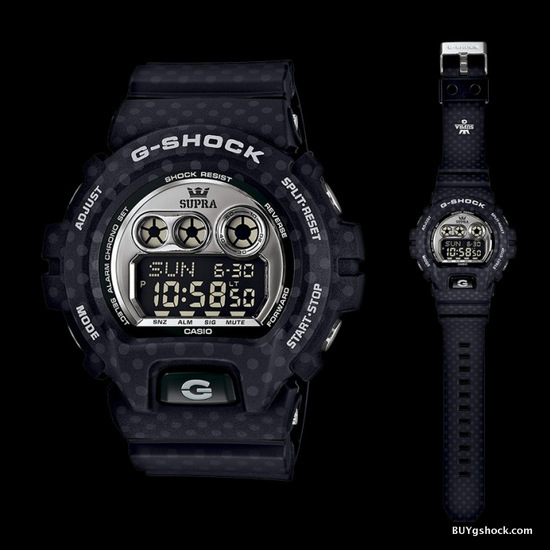 Parallel to the GDX6900SP-1 for men is the GMDS6900SP-7 G-SHOCK x SUPRA timepiece for women – released through the G-SHOCK S Series line. 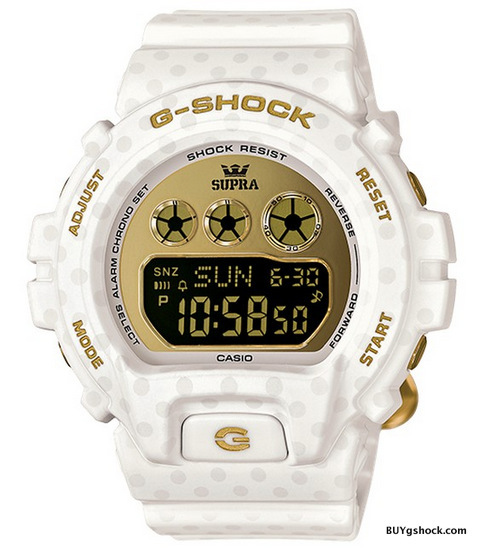 The white timepiece includes a 360 polka dot patterned design, 200M water resistance, shock resistance, 2 Multi Alarm + 1SNZ and World Time (29TZ/48 Cities and 12/24 Hr Formats). The model further features a 24 Hr Countdown timer, mute function, 1/100th Sec 24Hr stopwatch, and EL backlight with bright flash alert. 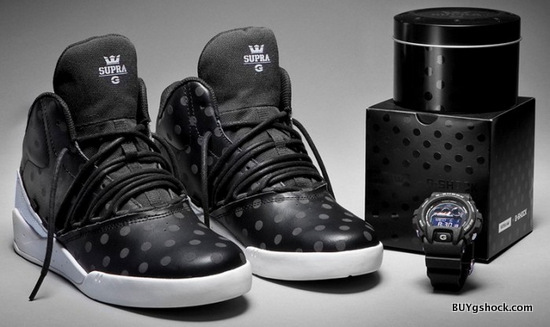 The inspiration for the black G-Shock x Supra sneaker stems from professional skateboarder Stevie Williams’ signature Estaban Supra model. The sneaker – constructed from a combination of black leather with tonal polka dots, silver metallic leather, and black canvas – offers exceptional comfort courtesy of an amply padded interior of black mesh and a white midsole constructed from lightweight Suprafoam To maintain the fast-paced athletic lifestyle, traction and added impact protection is ensured by a white rubber outsole and translucent heel pod. 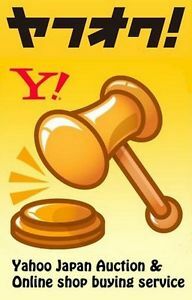 The retail price is ¥19,000 (including tax).